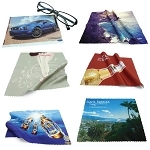 Custom Printed Microfiber Cloth 100% Polyester 170 GSM 5.5" x 6.75"
Custom Printed Microfiber Cloth 100% Polyester 170 GSM 4" x 6"
Custom Printed Microfiber Cloth 100% Polyester 230 GSM 7" x 7"
Microfiber cloths make a great giveaway item. Compact enough to carry anywhere, we all have items that could use a quick cleaning now and again - whether it's reading or sunglasses, smart devices or any number of items that can get a little dirty during the day. Our cloths come in a variety of materials and sizes. 100% Polyester: This fabric is our standard. It's soft and works great. Due to the nature of printing on material, colors will also come out more vivid on the 100% polyester. Our cloths come with great quality imprints designed to last. Print up to full color for vivid photographic printing with options to print front side only or both sides. Printing only the front side will leave the backside as solid white. Custom Printed Microfiber Cloth 80/20 Blend (our softest) 4" x 6"
Custom Printed Microfiber Cloth 80/20 Blend (our softest) 5.5" x 6.75"
Custom Printed Microfiber Cloth 80/20 Blend (our softest) 6" x 8.25"
Custom Printed Microfiber Cloth 80/20 Blend (our softest) 6" x 6"
Custom Printed Microfiber Cloth 80/20 Blend (our softest) 6" x 7"
Custom Printed Microfiber Cloth 80/20 Blend (our softest) 7" x 7"
Custom Printed Microfiber Cloth 100% Polyester 230 GSM 4" x 6"
Custom Printed Microfiber Cloth 100% Polyester 230 GSM 5.5" x 6.75"
Custom Printed Microfiber Cloth 100% Polyester 230 GSM 6"x 8.25"
Custom Printed Microfiber Cloth 100% Polyester 230 GSM 5" x 5"
Custom Printed Microfiber Cloth 100% Polyester 230 GSM 6" x 6"